No matter how much you love your job, if you do too much of it, you’re going to hate it. Part of the pride that comes from being a hard worker stems from demonstrating your stamina and your ability to manage unwieldy workloads. But the further you push yourself, the harder it gets to push. Eventually, no matter how much energy you may possess when entering your job, you are going to reach a point when your productivity, creative, and physical potential drop to zero. This is known as burnout and there are ways to avoid its pitfalls. Burnout can destroy your personal and professional lives as a symptom of long-term chronic stress. The most likely candidates for burnout are people driven by the will to endure and outperform everyone they meet. And this is one of the professional world’s greatest ironies: The most committed and hardest workers are the ones who fall victim to burnout. Burnout candidates are the ones who take more than the next person and tend to ignore the signs of overwhelming stress. Eventually, the body adapts to the presence of high stress and no longer appears to exhibit the warnings signs of impending burnout, but that is all an illusion. The Type-A personalities of the world continue to wear their bodies down until exhaustion overtakes them. Burnout is a multi-faceted shutdown affecting the mind, body, and emotions. Once burnout is reached, all of your physical, mental, and emotional energy have been drained leading to a suppressed immune system, decreased productivity, and even feelings of shame, apathy, and cynicism. The result of the shift from productivity to indifference is disengagement, leading to a mental disconnect and rising absenteeism. 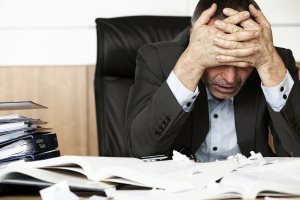 For the heroes of the working world who take until they can’t take anymore, the key to avoiding burnout is to realize the behaviors that lead to the condition and cut them out. These behaviors include the acceptance of persistent work overload, a sense of perfectionism, lack of recreation, chronic conflict, and giving too much of yourself emotionally. But how can you tone down the stress? The best way is to alter the way you approach your daily tasks, deal with stress, and expend your emotions. The main driver of burnout is the tendency to regularly overdo everything you attempt, so the main alteration to your life should be detaching yourself from your compulsive lifestyle. Tying all of your value into your performance pushes you to work harder to validate yourself. But when you begin to do less, which actually helps the performance of chronic burnouts, you can continue to enhance your value while limiting your reliance on destructive behaviors.